For more than a hundred years the basic architecture of our electrical grid has remained largely unchanged. Big centralized power stations, normally located outside of a city, supplying electricity to homes and businesses via transmission stations, substations and power cables. But that model of power distribution is changing. New technology is enabling the use of power in smarter, more efficient ways, helping manage the load as increased demand puts more stress on the grid. One way is by creating so-called microgrids – small, independent power grids that may be connected to the main grid but which in an emergency can operate independent of it. In Chicago, one place with a fully-operational microgrid is on the campus of the Illinois Institute of Technology. 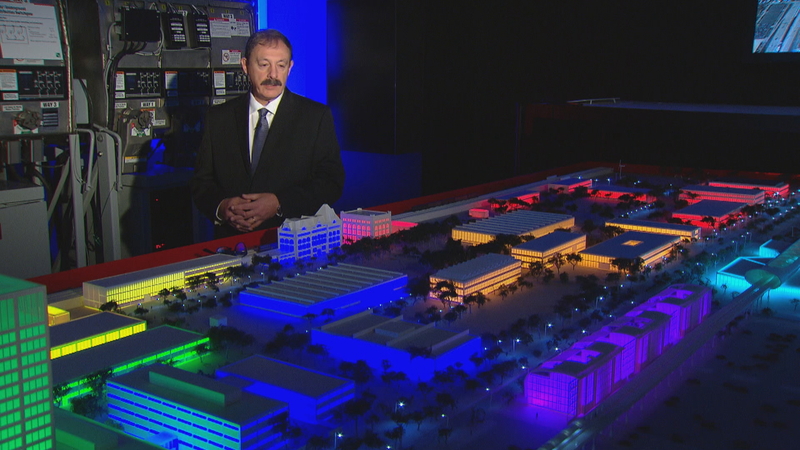 Using a model of the university campus, Shahidepour explains the layout of IIT’s microgrid which it first began developing in 2008. “What you see on the east side of the Green Line is mainly residential areas for students, faculty. And what you see on the northwestern part of the campus is primarily classrooms and down here is where I’m standing on the south side of the campus is a lot of research and a lot of operations,” he said. Different colors denote different minigrids – or loops – that have their own source of power generation matched to particular needs. Purple are student residences that consume the most power in the evenings. Red and orange are classrooms that need power during the day. Blue, green and yellow are research facilities that need power 24/7. That power comes from rooftop solar panels and wind turbines, and is stored in banks of batteries distributed around campus. Although IIT’s microgrid cannot supply all of the campus’s needs year round, it does supply most of them – generating roughly two-thirds of IIT’s peak summertime demand. Shahidepour notes that in one sense, this is old technology. And that smart technology can also save money. Batteries are charged from solar panels, wind turbines or from the main grid at off-peak hours – and then that power can be used as needed. While microgrids can be extremely sophisticated and expensive, they don’t have to be, says Shahidepour. Commonwealth Edison is certainly interested in exploring microgrid technology and has been collaborating with IIT. It hopes to build a microgrid in the neighboring Bronzeville community that will connect to IIT’s grid. Joseph Svachula, vice president of engineering and smartgrid at ComEd, says the utility is interested in how microgrids could be used to make our electrical infrastructure more resilient to weather events or even terrorist attack. Initially, microgrids could be used to power critical infrastructure but could eventually supply a community’s power needs more broadly, according to Svachula. There is, he says, a new paradigm emerging. He notes that in a place such as Puerto Rico, which is still largely without power after the devastation wrought by Hurricane Maria, microgrids could, in the future, make a big difference. In addition to added resilience and reliability, microgrids may also pave the way for a greener energy future, Shahidepour says. “Just putting solar in individual homes may be a near term solution, but as you go on and build more massive types of installations of renewable energy, definitely putting together a cluster like this where you can utilize everything that is nearby, including renewable energy is going to be the way of the future,” he said. Sept. 11: State regulators signed off Monday on an energy savings plan that consumer advocates say could cost downstate residents nearly 30 percent in savings on utility bills. Nov. 9, 2015: The veteran journalist who was anchor and managing editor of "Nightline" on ABC from 1980 until 2005 discusses his new book about the risk of cyberattack facing the power grid in the United States and the inadequate measures being taken to protect it.